To Live is to Dance! Ballroom Center is a full-service ballroom dance studio, providing the finest instruction available in the Chicago area for all dance styles including International Standard, International Latin, American Smooth and American Rhythm. We offer affordable dance classes and private dance lessons for both recreational-social and competitive adult students and professionals, along with an outstanding children’s ballroom dance program. Our instructors are superbly trained, certified professionals, focused on providing you with a truly enjoyable experience as you gain the fitness, confidence and joy that dance brings to your life. Join a class (no partner required!) to learn dances like the waltz, foxtrot, tango, salsa, and swing in the camaraderie of a group setting. Or, sign up for private lessons customized just for your needs and desires. Come to Ballroom Center to learn social dancing, or to refine your skills for Dancesport competition. Dreaming of the perfect wedding dance? We specialize in unique choreography created just for you, or we will teach you all the basics you need to make your first dance as a married couple memorable, elegant and stress-free. Ballroom Center is located in a beautiful, custom-created studio in downtown Libertyville, convenient to the highway and only 30 minutes from Chicago. 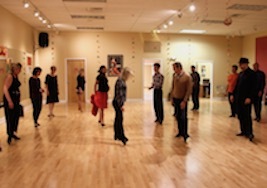 The ballroom features fabulous, shock-absorbing Junckers floors (the same floors used on TV’s Dancing with the Stars!) and a state-of-the art sound system. On your own or with a partner or friend, whether you’re a beginner or a seasoned professional, whether you want to meet new friends while learning basic skills or train for competition, Ballroom Center is the place for you. We invite you to join our dance family and have the time of your life! 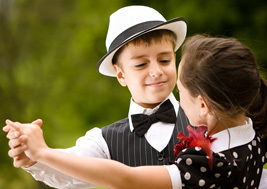 Ballroom Center is Chicagoland's premier studio for kids' Ballroom and Latin dance, offering private and group instruction for children ages five and older. Allow us to give your child an appreciation for music, movement, and dance while having fun and staying healthy. Through the art of dance, your child will learn teamwork and develop discipline, self-confidence, communication and social skills. Grace, poise, manners, balance, and strength are a few of the other added benefits that will be useful throughout their lifetime. Let your children make new friendships and enjoy camaraderie in a beautiful, safe, friendly, and encouraging environment. Private lessons may be scheduled during studio business hours. Youth group classes are held Monday through Thursday evenings for various experience levels. Ballroom Center would be honored to help make your wedding day a memorable one! Let us create beautiful memories for you, your family and your friends while making your special day less stressful. We specialize in creating custom choreography to the song of your choice. Don’t want choreography? No problem! Let our instructors teach you the basic steps to the most popular dances which will have you moving around the dance floor with ease. These steps and techniques can be utilized for your honeymoon and other events for years to come. 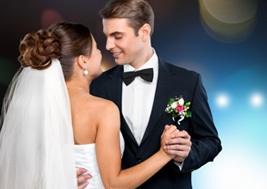 Allow us to give you the confidence you need to relax and truly enjoy your first dance as a married couple! Bring your entire wedding party to join the fun! In addition to creating wedding dances for couples, we also specialize in Father-Daughter dances and Mother-Son dances. As a new student at Ballroom Center, our Introductory Special is the best way to start! This lesson is designed to acquaint you with the studio, our staff, our programs, and our teaching style. Plus, you are able to choose an evening to come back and try one of our group classes. It's easy...Call TODAY to schedule your 30-minute introductory lesson! No partner necessary! Private lessons help you develop your skills quickly and individually. Each lesson will be tailored to your needs, interests and desires. Through a customized lesson plan we will help you achieve all of your dance goals! With a focus on technique, rhythm, and partnering skills, we will give you the confidence to dance well in any social setting. Bronze classes are designed for students who already have a strong foundation of basic patterns developed in their private lessons and focuses on the techniques that produce strong and stylish dancing. Beginner/Intermediate classes accommodate people with minimal dance experience, as well as our intermediate level dancers and anyone looking to brush up on basics. Dance Fusion is an exciting and fast-paced fitness class combining the best parts of all your favorite dances. Wear your workout attire and prepare to sweat! the industry. Some of his accomplishments are listed below. Donald prides himself in his ability to share the love of dance with his students and mentees. 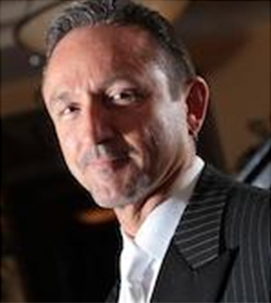 As a valued coach, judge, teacher, mentor, and co-studio owner, Donald is a vital asset to Ballroom Center and anyone’s dance career that he has ever touched. became a strong competitor as a professional in the International Latin division where she earned a number of championship titles with her partner, while also coaching her students to a successful level and high achievements. Irina’s contribution to the dance community is unmatched and her dedication to her students is inspiring. Irina takes great pride in her students and their achievements. She has cultivated a talented group of individuals serving as a premier coach and mentor to numerous junior, adult amateur, and professional couples. With 28 years of dance experience, 20 years of teaching adults and children, and 17 years of studio ownership, Irina has become a highly respected coach, mentor, and competitor to dancers of all ages and levels. As co-owner of the studio, she hopes to extend her love of dance into your heart and home as well.